We planted grass seeds in the backyard. And every morning, I turn on the sprinkler to water the soil. Then I turn it off. And then on again, once or twice in the afternoon. In 3 weeks, we should have fluffy green grass. On the way back inside, I usually walk past my garden to check out what’s going on. I’ve done nothing to it so far; the soil is dry, there are yellow dandelion weeds everywhere and I’ve just learned that my cat, his Majesty, uses this outdoor space for his own personal litter box. I glare at him from a distance. I planted one itty, bitty off-shoot last year and look at it now. It’s strangling my oregano. I have to say, these are some of the heartiest plants I’ve ever seen. We’ve had about 20+ ridiculously cold snow storms this winter and I’m telling you, not one of those plants died. It seems contradictory since strawberries themselves are so delicate and sweet. But here they are, green leaves and white blossoms. We’ll have juicy, homegrown strawberries in the beginning of June. So, one morning after my sprinkler duties had been fulfilled, I found myself in the kitchen staring at the makings of my son’s French toast: eggs, milk and cinnamon. Leftovers like this drive me crazy. Dillon likes French toast and Jake doesn’t which means, inevitably, I only make one slice. Now, not only do I have to make 2 separate breakfasts in the morning (yes, I’m that mom) I end up wasting the leftover egg batter. That’s practically a whole egg. What if I used the leftovers to bake something? I mean after all, most recipes call for at least one or two eggs, right? I made a quick batter in my food processor, followed by a spiced crumble topping to scatter over the top. Thick-slices of strawberries were wedged into the mix. I meant to add toasted walnuts, but I forgot. I love strawberries and walnuts together. 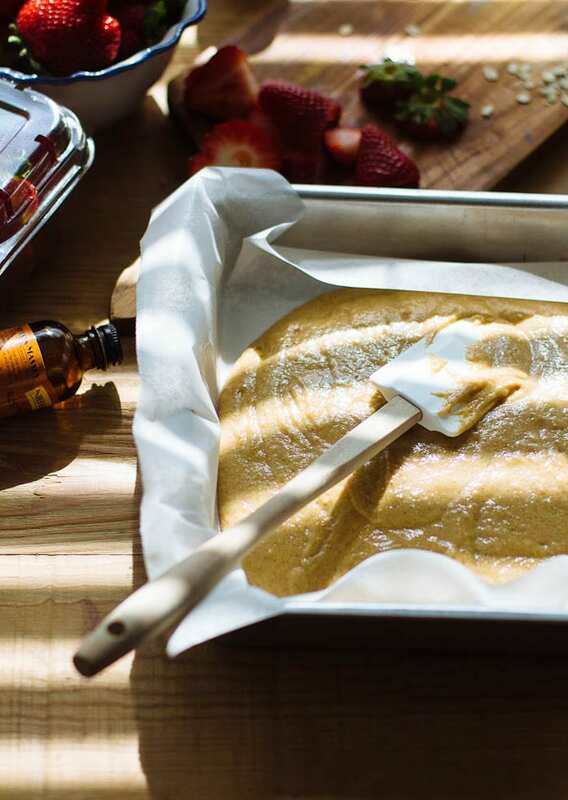 Then the big question at hand: bake in a 9×5 loaf pan? Or 8×8 square pan? I went with the latter because of its shallow depth. This way, the crumble topping to cake ratio would be somewhat equal, and of course, suited to how I like it! This is the important stuff, clearly. And speaking of, it’s also important to note that I used whole wheat flour or possibly spelt flour (the bag is not labeled- either one is fine) in my cake. Therefore, I deem this recipe perfectly acceptable to eat for breakfast. The base of this cake is sweetened with maple syrup, not sugar. To save a couple of bucks, use Grade B maple syrup instead of Grade A. The quality is totally fine and is better suited for baking. You could also sub 1 cup brown sugar instead if you’d like. No strawberries? No problem. Use blueberries, apples, pears or even peach slices. Pitted cherries and plums would work too, so basically, use whatever you want… except for green grapes. That might be weird. Eat this cake within 1-2 days. Any longer than that, the strawberries will get soggy. Preheat your oven to 350 F. Line an 8x8 baking pan with parchment paper to prevent sticking. To make the crumble topping, add all of the ingredients to a large bowl and mix together with your hands. It should look crumbly, not blended. Set aside or refrigerate until ready to use. For the batter, crack the eggs into the bowl of a food processor. Add the oil, yogurt, milk, maple syrup-use ¾ cup for lightly sweet and 1 cup for more flavor- (or sugar) and vanilla extract. Pulse until well combined. Add both flours, cinnamon and baking powder. Pulse the machine again, just a few times, until the batter has come together; do not over mix. Over blending is the cause of tough, heavy cakes. Pour the batter into your lined baking pan. 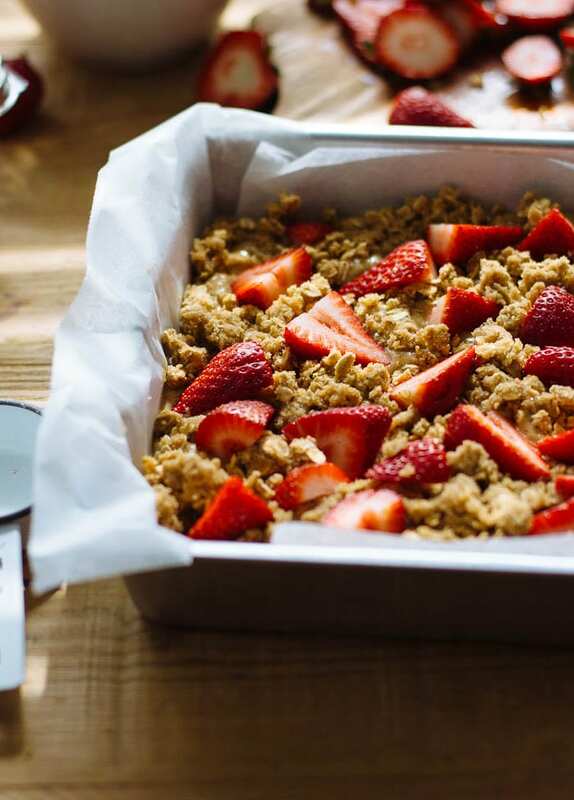 Scatter the crumble topping over the top and wedge in your sliced strawberries. Bake in the oven, center rack, until a toothpick comes out clean when inserted, about 30-45 minutes. Previous Post: « I’m writing a cookbook! Looks like the perfect breakfast to me! So delicious! I will plan this for the weekend. Can you clarify the 3/4 of maple syrup I am assuming C? This breakfast looks so hearty and delicious! I can’t wait to try this. Hoping your grass starts coming in soon..it’s so much fun waiting for things to grow! Hi Megan! So, according to the back of the package new grass takes about 8-10 days. So far? Nothing. It’s like watching water boil. We’re hoping for the best! 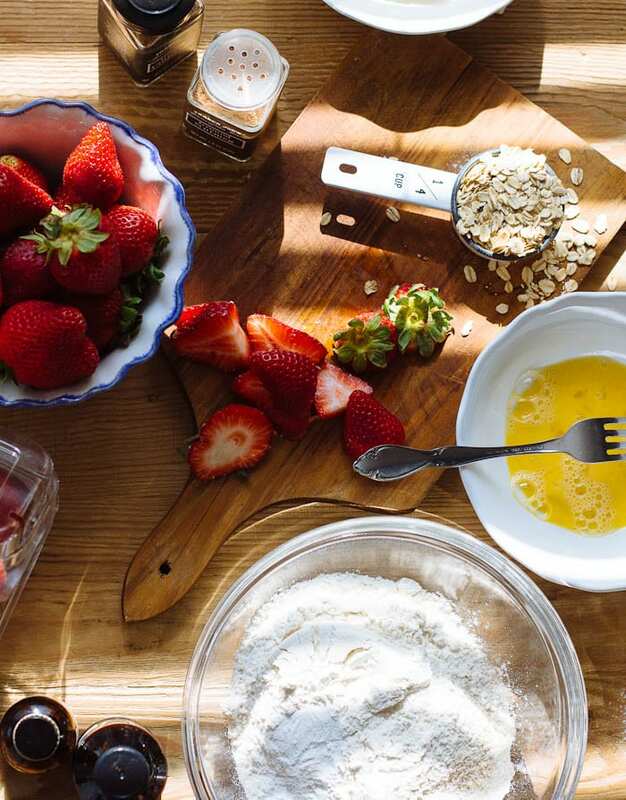 In my world cake IS always good for breakfast, but most especially one like this filled with such breakfasty, healthy ingredients; eggs, yogurt, oats, strawberries, of course that’s breakfast! Looks yummy, I can’t wait to give it a try. and, I am also one of those moms who makes different meals for each kid, at least the big one eats what I eat! Cake for breakfast now that sounds like my kind of breakfast, looks wonderful. You’ve got an instant garden back there! Hurray for the work of previous homeowners! Watch out, you know, that mint tends to take over. I finally pulled all my mint and put it in a pot. There. Contained. And you have glorious strawberries! I say the tastiest, juiciest strawberries are the ones picked from you own garden.. although pickin at the local strawberry patch is really fantastic too! I love spring surprises and it looks like you’ve many! I love my instant garden, Traci! 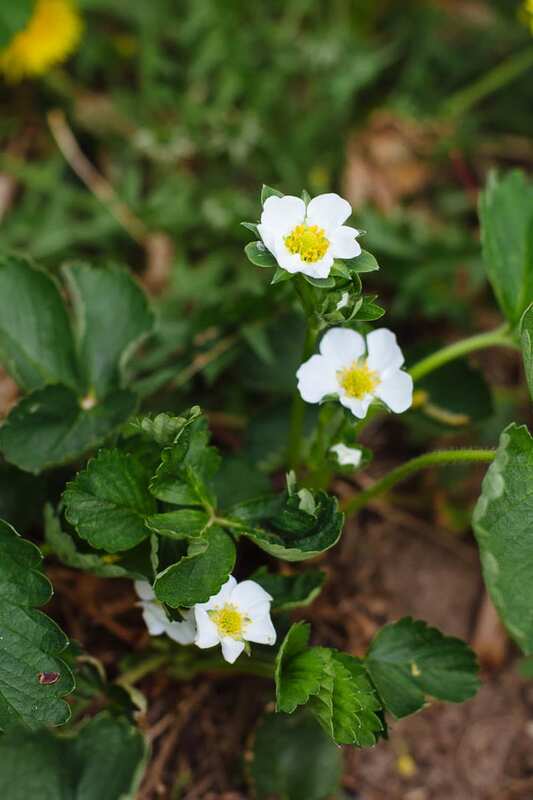 Really, it’s so nice to see what’s popping up as of late, the strawberries in particular. If my boys don’t pick them all, I plan on making on making a berries and cream tart- my fave. You are SO right about the mint. It’s crazy. Hello beautiful one! Ah, this is such a gorgeous start to my morning (not sure what time it is over there but here it’s 8:30 and I’ve already been at work for an hour *sigh*). 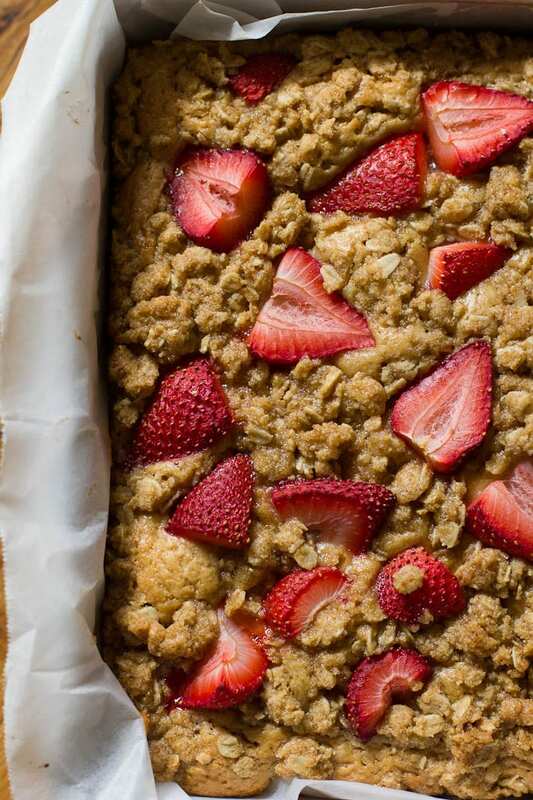 I love the combination of oats/crumble and fruit, and the idea of eating cake for breakfast? Oh so good! I’m gonna try this recipe next sunday, I can’t wait! That looks delicious. You had me at “breakfast cake” — sounds delicious. Congrats on the book! OMG you have a beautiful garden AND mint! So jelly! But I am really jelly because I wish a slice of this was in front of me this morning. 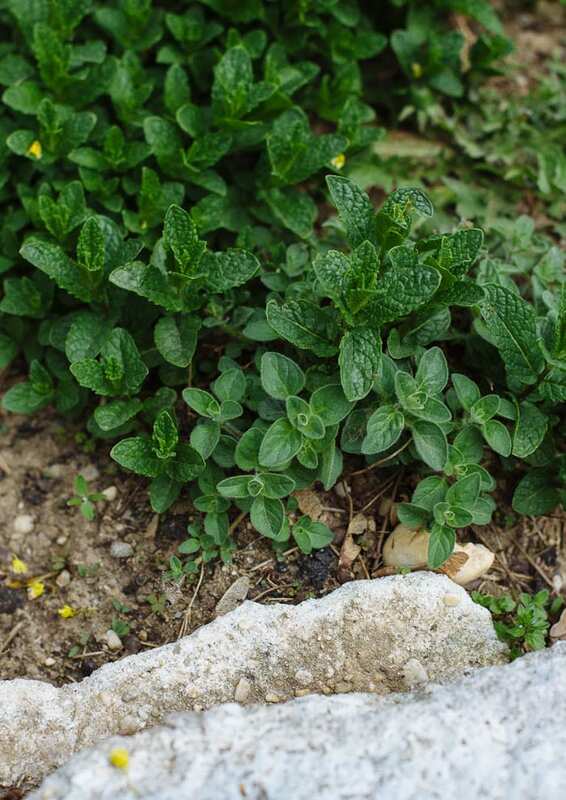 2 things…i’m convinced mint will take over the earth one day! haha! the other thing is that this cake just screams spring! it’s such a refreshing break from the usual. can’t wait to try it! have a wonderful mother’s day!! This looks so yummy, I can not wait to try it! I love the fact that it uses pure maple syrup. That’s all anyone uses here in New England..there is no substitute! My blog is all about art, photography and creativity…and yet most of the blogs I follow are ones that are full of recipes! (Hey artists have to eat, right??) Maybe I love your site so much because as a photographer, I appreciate how visually, you make the food look so yummy. You have a great eye for composition! Breakfast cake sounds just perfect to me, love the strawberry topping! Made it for Mother’s Day and was a huge success. Served it with champagne and orange juice, great way to start a special day!! Look forward to additional recipes to try. Did you know that maple syrup is normally graded by color/flavor, not quality? Vermont Grade B Maple syrup has the darkest color and deepest flavor. (It’s my favorite.) And US Grade B is dark and very flavorful. has a pretty good explanation of the various grading systems. I made this last night to eat this morning and we just had our first piece. It’s delicious and moist. I made it with tons of blueberries (maybe like 2 cups not sure). I also sprinkled the top with cinnamon before baking instead of using the crumble top to try to make it even healthier. It tastes like a perfectly moist blueberry muffin cake. I love the way you order the ingredients to make it easy to track! Thank you. One request – I made the cake this weekend but mine turned out kind of dense. I didn’t over mix like you mentioned. Would it be possible to post a photo of a slice of the cake so I can tell whether mine should’ve been fluffier? 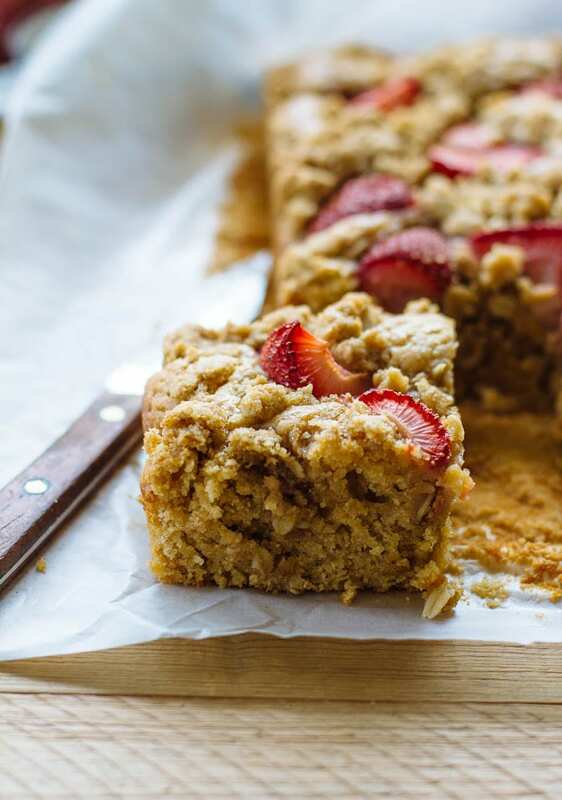 Recently made this coffee cake and included it in my Fav Spring recipes because WOW! So tasty! Seriously one of my fav coffee cakes ever! Made it with Blackberries instead and it was still so good. Great recipe! Thanks as always for the fab food and inspiration. Hi Valerie! I’m so glad that you enjoyed the cake! It’s so versatile too, you can switch up the fruit any way you’d like. Thanks so much for the feedback!